OB Green flashes - photo by Jim Grant, August 2010. Local restaurant, bar and coffee house owners suspect their businesses are little known outside Ocean Beach, which is why they’ve formed a special association to spread the word to all of San Diego. The recently launched Ocean Beach Restaurant and Entertainment Group will serve as an offshoot of the already existing Ocean Beach Main Street Association to specifically promote the dozens of restaurants, delis, markets, coffee houses and entertainment venues in the community. The Sunset Cliffs Trunk Sewer project is slated to begin in September, stated a city representative at the Ocean Beach Town Council meeting on August 25. The extensive sewer repair and replacement project — which will tear up one of the main thoroughfares in Ocean Beach — is due to last nine months. Project engineer Riyadh Makani said that there is the possibility of major impact on traffic: one lane will be closed in sections of involved roadway during the hours of 8:30 a.m. to 3:30 p.m. Directors of the project are working with public transportation officials to ease conflict with city bus lines. The Sunset Cliffs Trunk Sewer project seeks to upgrade and improve the capacity of the 40-year-old trunk sewer lines in parts of Ocean Beach. The project will focus on Sunset Cliffs Boulevard between West Pt. Loma Boulevard, through the cross-street of Pt Loma Avenue. Also, Bacon Street between West Pt. Loma and Long Branch Avenue. For the remainder of this flow, go here. “Terriers”, the TV series filmed and set in Ocean Beach, is scheduled to begin broadcasting Wednesday, September 8th. According to a spokeswoman, the filming company hired a hundred locals for their film crew, plus hundreds as extras, and spent $20Million in San Diego during the filming. Here is Anthony Gentile’s report …. Ocean Beach will find itself in the cable TV spotlight next month. The pilot show of FX network’s comedic drama “Terriers,” filmed and set in Ocean Beach, will air at 10 p.m. on Wednesday, Sept. 8. 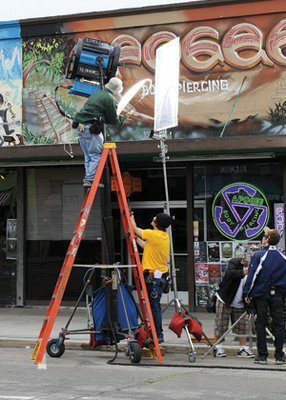 In April, production crews took over Ocean Beach for a few weeks during the filming for “Terriers.” In online promotions for the show, various locations around Ocean Beach are featured and the storyline takes place in Ocean Beach. For the remainder of this really beeg show, go here. Costco-Lowe’s presented a proposal to purchase the 436,000-square-foot former Midway Post Office at a late July North Bay Community Planning Group meeting. This proposal competes with another one for a 2,000-person self-contained homeless community facility pitched by local nonprofit Amikas. The Peninsula Beacon reported that spokesperson for the U.S. Postal Service said postal officials are considering multiple proposals to purchase the facility. …approved a revised version of its bylaws with a 10-1 vote. Among the most significant changes were those involving elections — changing general elections to a plurality system and having vacancies filled by the board itself. There were also changes to language within the bylaws. The revised version of the bylaws was finalized three days before the Aug. 19 meeting at a special subcommittee meeting and were put online at www.pcpb.net. Copies were made available at the meeting and the public had the chance to provide input into the decision before it was made. At its July 15 meeting, the PCPB voted 6-5 to move the decision until this month. The City Attorney’s Office and City Council must approve the revised bylaws before the board can implement them. The OBPB meets at 6pm at the Ocean Beach Recreation Center – 4726 Santa Monica Ave.
Join the Ocean Beach HS on Sept. 16, for a presentation entitled, “Who is Buried in Presidio Park?” by author Richard Carrico, who teaches at San Diego State University Department of American Indian Studies and Recuerdos Research.His extensive research and writing about our local history and Indian cultures mixes intrigue with historical events will make for a memorable evening. The Archaeology At Presidio de San Diego presentation is for Thurs., Sept. 16, 2010, 7 p.m., at the PL United Methodist Church, 1984 Sunset Cliffs Blvd., O.B. The World Wide ESL Institute is having a free talk by Heidi Cohen-Wolff, a local animal activist, as part of their 2010 Guest Speaker Series features. She will be speaking about humane education, Wednesday, September 1, 2010, 10am – 12pm, at the Institute’s NEW location, 1811 Sunset Cliffs Blvd., 92107. Saturday, September 11, 2010 at 5099 Newport Ave., 92107 and surrounding area. If you don’t have a wristband you will not be able to get into Gallaghers Pub, The Harp, or Winston’s during festival hours. jiminy-sakes! $200! for an ocean beach festival, in the middle of a heavy-duty recession?? what is ob coming to? somebody better get a photo of the $200 plate folks eating alongside some homeless guy – it would fit right in the movie Dr Zhivago – remember that scene? the rich are at a fancy restaurant and poor come to the window to look in. I thought the same thing, bsb. I guess you get “access” to the venues and dinner with other cpwc (cool people with cash), but I’m afraid I’d expect my drinks to be covered as well. I wish they’d publicized where the profits were going. I might be a little less appalled if it was a benefit event. Is it? 200 dollars to chill out in the ob hotel parking lot and have catering from restaurants I eat at all the time.Who is performing,Dave Brubek?And you get to overpay for beer on top of that.awesome.oooooooh i can get into Gallaghers though.Sign me up. For $200 I can get 4 body massages!!!!! Jim Grant does fabulous photographs. The sunset is exquisite! If there are any therapists in OB that are into Thai or deep tissue, please post. It would be great to work with someone local with reasonable rates. TX! Just read a rumor on facebook that a corporate sandwich shop may have somehow had a hand in the Mariscos taco truck leaving OB. Can the Rag do some investigative reporting to find out the real reason the taco truck is gone? I looooove that truck, and will miss it (they are now in South Park, I hear). But it’s really not that important who called, I think (although yeah, I have heard the same rumor). The properties with all those new carts/trucks weren’t zoned for that use, and that’s more or less the end of that. Would I have called on them? Nope, but then again, I don’t have a big lease and am not being undercut by another nearby business that is in violation of codes. I will say that I’m not too sure that truck was the problem everyone thought it was. Pizza Port (who has very cheap lunch specials) and several other big eateries opened all around the same time within blocks of each other. Whether the Newport Ave area is getting oversaturated with restaurant uses is possibly something that new restaurant and entertainment community group could talk about, although I suppose the market will take care of that on its own. “NOTICE IS HEREBY GIVEN that a bulk sale is about to be made.